Known as the Gate of Man, the stars of Cancer were seen as the doorway through which souls came down from heaven to be born into this world. With the Sun in Cancer, you are a deeply sensitive, intuitive person, subject to a range of changing moods that ebb and flow just like the tides that Cancer and the Moon, Cancer's ruler, govern. That does not mean that you always show your sensitivity to others, though, as when hurt you tend to hide your feelings under your hard shell. Nor do you ask for sympathy from others in a direct way, and only those who get to know you well understand the power of your emotions. But you also have a stronger, more creative side, as you are naturally tuned into the great collective currents in life's ocean. For maternal Cancer has the gift of giving life, and form, not only to a human family, but to new ideas and truths in art and writing, as your sensitivity enables to act as a real channel to the truths that are of value to mankind. You also have a vivid sense of history and a tendency to hoard mementos and to feel nostalgic. 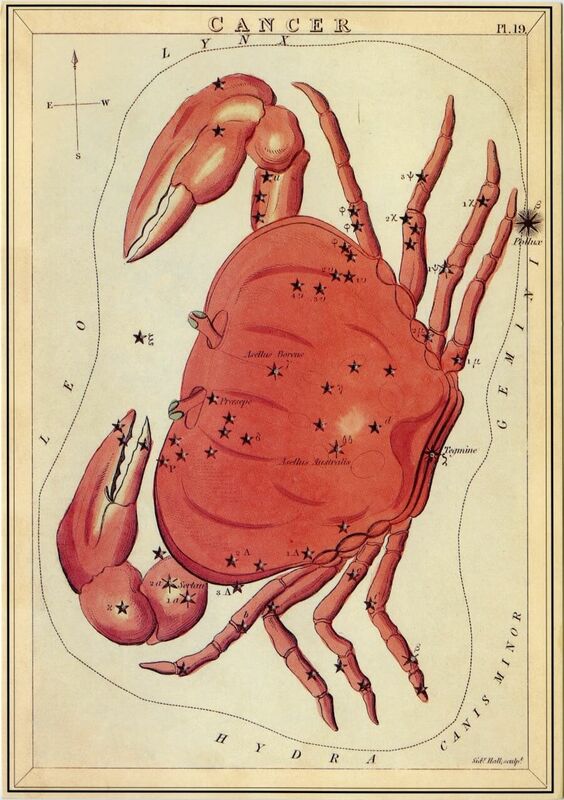 Cancer, the Crab, which lives on the shore of the ocean, is ruled by the waxing and waning moon, which rules the tides, and which was thought to be in Cancer at the time of the Creation. Like the Moon, and the sea, which is the source of all life, the crab belongs to the Great Goddess, who resented the great solar hero, Hercules' bid for freedom from her thrall. In his battle with the many-headed Hydra, all the animals were on his side, except the crab, which snapped and clung onto his ankles. In ancient times, the stars of Cancer were also known as 'the Gate of Man' - the doorway through which the souls of men came down from heaven to be born into this world of change ruled by the Moon. Cancer has always been seen as a hard-shelled animal. It was a tortoise in Babylon and the sacred scarab beetle of the sun god in ancient Egypt. The ruling planet of your personal chart is the one that rules your Rising Sign. However, if Cancer is your Sun Sign, its ruler, the Moon, will also play an important role in your psychology. As Queen of the Night, the Moon is an age-old image of the Great Mother Goddess, ruling intuition, instinct and emotion. Feminine, maternal, imaginative and sensitive, it links us to our past and to the ever-changing rhythms of the earth and tides. Its position at birth colours both your instincts and your intuition. The Moon, then, represents the intuitive, instinctive side of your personality. The way that you relate to others, your instinctive emotions and habitual responses, as well as your relationship to your mother and your family, are all ruled by the feminine, passive and sensitive Moon. The values, general orientation, and 'atmosphere' of the sign it occupies in your chart, as well as any links between the Moon and other planets, reveal a lot about your childhood home and upbringing, your roots and your past. It is connected with nurturing and safety. 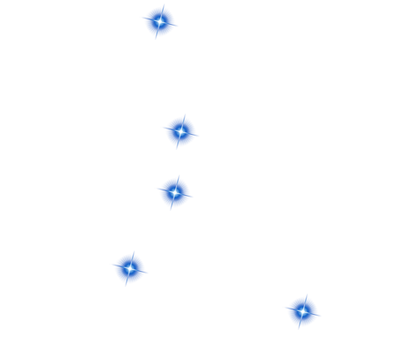 Although the stars of Cancer make up one of the most inconspicuous of the constellations, described as 'black and without eyes', it was of prime importance in the ancient world. Known as the Gate of Man, it was the doorway through which souls came down from heaven to be born into this world of flux and change ruled by the moon. Although its stars are dim, Cancer boasts the famous Beehive Cluster in its centre. Also known as Praesepe, or the Manger, in which Christ, perhaps, was born - possibly because that was the Gate of Man - it is only visible to the naked eye as a fuzzy spot, but it is one of the closest star clusters in the sky. Cancer lies between Gemini and Leo on the zodiac band. It is best seen while looking south in spring in the northern hemisphere, and in autumn in the southern hemisphere, looking north. It lies between Regulus in Leo to the east, Pollux in Gemini to the west and north of Procyon in Canis Minor.